SIMONA Boltaron materials have excellent thermoforming characteristics. Unlike other thermoplastics, our sheet doesn’t require pre-drying before thermoforming, which means you can save time and money during the fabrication process. 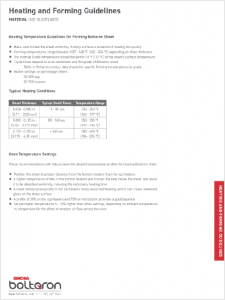 To ensure you have the best success during thermoforming, follow our suggested guidelines regarding heating and forming. If necessary, a qualified and experienced expert in the distinct properties and performance of SIMONA Boltaron sheet would be happy to visit your facility to train, diagnose, and guide the production of formed parts with the highest quality, best appearance, and longest service life.